Virtuoso performer on balafon, talking drum and African harp. Winner of top national music awards: Burkina Faso, Mali & Austria. Opening guests: the Victoria Percussion Orchestra & the UVic African Music Ensemble. Mamadou Diabate was born into a traditional musician family (Sambla people) in Burkina Faso (West Africa), with a long tradition of practising the profession of story telling and music making. He has performed in many countries, including Austria, Belgium, Germany, Switzerland, Czech Republic, Denmark, Norway, Russia, Malaysia, Mali, India, Burkina Faso, Poland, Mexico, Columbia, Solvenia, England, Spain, Portugal, United States, Indonesia, Senegal, Uganda, Zimbabwe, Rwanda, Ghana, Italy, Holland, France. At the age of 5 he started his professional training with his father Penegue Diabate, who in his days was considered the best balafon player far beyond the bordes of the sambla culture. At 8 he began with his apprenticeship years with renowned balafonists of neighboring peoples. In 1988 and 1998 he won the first prize of the “National Culture Week” of Burkina Faso. 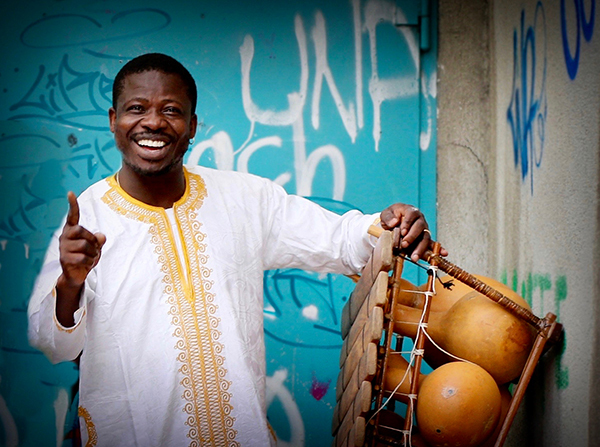 With his group Percussion Mania he won the Austrian World Music Award (2011) and the Grand Prix of the “Triangle du Balafon” Competition in Mali (2012). For his virtuosity, he was there also honored with the “Prix Alkaly Camara de la virtuosity”. In 2017 he was made Knight of the National Order (Chevalier de l’Ordre National) of Burkina Faso. He has released 11 CDs with his own compositions and 2 others with authentic music of the Sambla and Tusia peoples (both world premiere).